Nearly 100 community members showed up to discuss the design of six trolley stations as SANDAG proceeds with the 11-mile extension of the Blue Line to UC San Diego and Westfield UTC. Constructions is set to take place from 2016 to 2018 with the new line in operation by early 2019. The meeting was scheduled to discuss preliminary architectural design, but residents of the community around the Nobel Drive station expressed concern about parking and congestion. That is the only station among three in the UC San Diego area that will have new parking, in the form of a parking structure that adds 260 spaces. “How is that enough for three stations?” asked one woman who lives in the Villa La Jolla neighborhood. SANDAG’s John Haggerty said traffic planning studies predicted that number of spaces would be sufficient and promised to provide the study and data to residents. 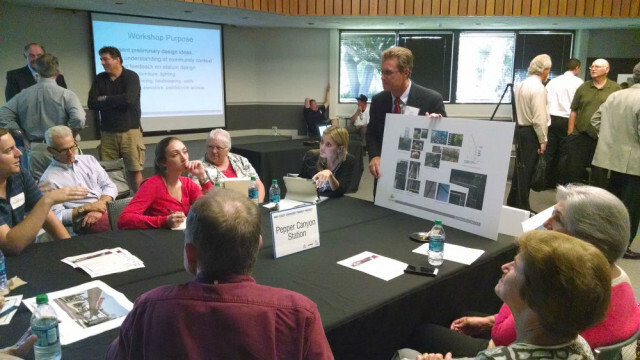 The Nobel Drive station was the only one that attracted significant concern during the two-hour public workshop at the Westfield UTC Forum Hall. Additional public workshops are scheduled through August, including three that will discuss the controversial stations in the Linda Vista neighborhood. One Linda Vista resident, Harry Jensen, came for the beginning of the UTC meeting and said his neighborhood didn’t want the trolley project at all, citing concerns about traffic and new development. “We’re absolutely against the trolley,” he said.